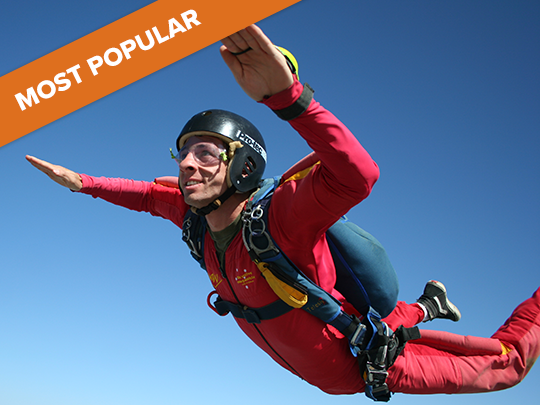 Take your skydiving tuition to the next level, with our Amateur to Awesome accelerated learning package! Do your first jump course on a Saturday, and then progress through all the requirements to gain your Certificate A qualification and become a licensed skydiver! Dedicated Course Manager - Day Trips, Pub, Movie nights and more! Want to spread the cost with up to 6-months interest free? Apply here with zipMoney. All students must be 16 years of age or over, if you are under the age of 18 you will need parental consent. Maximum weight limit is 100kg for safety. All students are required to be fluent in the English language or able to demonstrate an understanding of the English language (IELTS 5.5 or equivalent). Please note prices exclude any repeat stages, or any additional solos required to meet the accuracy requirements for your A certificate.